In several major areas of international trade¿particularly software and technology transfer¿a harmonised regime of intellectual property law is a crucial prerequisite to success. Yet this legal concept appears to be extraordinarily difficult to establish on any agreed-upon basis among countries. And nowhere has the sought-for harmonisation proven more intractable than in the countries of the Asia Pacific region. Intellectual Property Harmonisation in ASEAN and APEC investigates the complex issues that lie at the root of this major block to the unhampered global flow of commerce based on intangible assets. By highlighting the background of Asian legal systems, both in terms of culture and intellectual property systems, the authors suggest how the current obstacles towards greater harmonisation and integration may be overcome. Defining the accepted principles enshrined in TRIPS, the Paris Convention, and other international agreements, the presentation describes the relatively successful European experience and then goes on to develop strategic variations geared to relate more precisely to harmonisation, integration and co-operation in the East Asian region. the experience of patent office cooperation and its potential as a model for smaller countries. The contributing authors have all worked in the IP field for more than a decade and have followed closely the developments of intellectual property law since the advent of the TRIPS Agreement. Their collective expertise includes both academic and practical considerations on IP harmonisation. 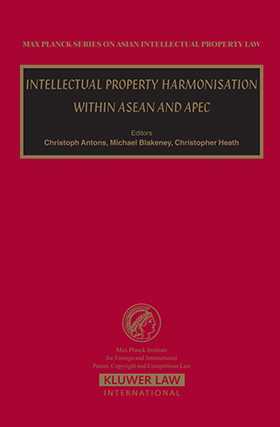 Intellectual Property Harmonisation in ASEAN and APEC will be of great value and interest to policymakers seeking effective enforcement of intellectual property rights, to international lawyers counseling clients on Asia, and to academics working in the fields of intellectual property or Asian law.